These days, the only thing hipper than liking Wes Anderson is hating Wes Anderson. The man has taken enough flack for an entire movement, with detractors ranging from The Atlantic Monthly (who lampooned his oeuvre in an essay entitled “Quirked Around”) to Steely Dan (the aging rockers took to their website to write Anderson an open letter that vividly narrates the degeneration of his career into “self-imitation and a modality dangerously close to mawkishness”). In the New York Times review of The Darjeeling Limited, A.O. Scott referred to the director as “precious” and “cliquish” before slyly admitting that he, in fact, enjoyed the film. Many resent Anderson simply because of the social tribes that have adapted him as their mascot: nerd-chic college kids, hipsters who are a little behind. An Anderson film can act as a sort of cool-kids Koran, with embedded instructions on what to wear, read, and listen to. (The Defense Speaks: It’s not his fault his aesthetic is so appealing.) Indeed, he is more than a filmmaker. He’s a buzzword. A manager at the Lower East Side restaurant where I once worked posted a Craigslist ad looking for a bartender and noting that job applicants “must know who Wes Anderson is.” This elicited angry responses in which the manager was called names like Royal Tenendouche. Certain critiques of Anderson’s work have an undeniable truth: his films are defined by a theatrical distance, a maximum of visual pomp and a minimum of emotional circumstance. But everything about an Anderson film is meticulous and studied, from the careful costuming to the delectable soundtracks. Could a self-aware control-freak like Anderson really have overlooked something as important as feeling? This viewer doubts it, choosing instead to regard Anderson’s cool remove as a narrative device and, on a deeper level, an almost-Zen theoretical and/or spiritual position. Let it be known: I like this guy’s work. The Anderson aesthetic becomes more pronounced with each consecutive film, the art direction more impeccable, the universe more controlled. Looking back at his first feature, 1996’s Bottle Rocket (which Steely Dan consider the director’s “finest work to date”), it is almost possible to ignore the auteur’s handprint. But not quite. And why would you want to? Bottle Rocket tells the story of Anthony, Dignan, and Bob, three Suburban guys on a mission to achieve minor wealth, glory, and purpose through an ill-conceived heist. Anthony (Luke Wilson) has just emerged from a Holden Caulfield-esque existential crisis and his best friend Dignan (Owen Wilson) believes pulling off a criminal job for mobster Mr. Henry is just what Anthony needs to reenter the world and reclaim his lost spark. The Wilsons look shockingly fresh-faced in their first-ever film roles—this was long before Owen’s “personal troubles” or Luke’s string of celebrity girlfriends—but their humor is as wry and Texan and full of nerdy swagger as ever. Owen gives his signature performance, the one that now earns him the big bucks, while Luke’s charming, sensitive turn really makes you wonder how he became the straight-to-video Wilson. 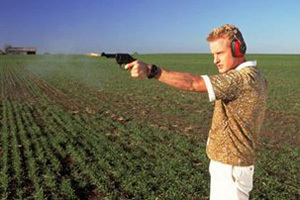 Bottle Rocket is an incredibly winning film. Although it plays out in an environment far less stylized than the Tenenbaum household or Steve Zissou’s boat, it shows hints of the obsessive styling that now define an Anderson feature: a vintage trans-am radio here, a well-packed suitcase there. And the script, like all of Anderson’s, is chock-full of notable quotes (Dignan, most memorably, on the subject of a judgmental nine-year-old: “She said you’re a failure? What did she ever accomplish with her life that’s so great?”). But Bottle Rocket’s most compelling (and most Andersonian) quality is the potent mix of nostalgia, sentimentality, sweetness and utter selfishness that exists within each of the male characters. Last week, Bottle Rocket was given the Criterion Collection treatment. Its original cover image, the would-be criminals squinting over their dinky guns, has been replaced with a decidedly more Anderson-as-we-know-him pastel illustration. A whole mess of special features sweetens the deal, the most notable being the short film that gave birth to Bottle Rocket. This black-and-white seedling reminds the viewer that everybody, even the slickest stylists, had to start somewhere. In fact, the less formally rigorous Anderson is nothing short of endearing. But I don’t have a problem with what he’s evolved into either.